The fully assembled holding frame of a Han-Eco® B can be snapped into the back of a mounted housing with an audible click. HARTING now also offers its Han-Eco® range in the industry standard Han® B size. This permits users to configure robust, flexible and corrosion-resistant connectors made of high-performance plastic for demanding industrial environments. The ability to snap contact inserts into the mounting housing from the rear simplifies equipping control cabinets with interfaces. The Han-Eco® B differs from the Han B® industrial connector in a metal housing chiefly in the ability to perform assembly from the rear. While in the case of the Han® B standard housing, the cables are first routed through the assembly cut-out in order to take care of the inserts outside the control cabinet, Han-Eco® B allows the prefabricated inserts to be snapped-in directly from the interior. This facilitates the assembly of prefabricated units since the electrical cabinet and cable harnesses can be pre-assembled separately. The division of labour improves, working time and costs are saved. And, if necessary, processes can also be outsourced. The Han-Eco® B is fully plug-compatible with Han B® metal housings. This gives users the freedom to use the advantages of both materials, depending on the requirements of their system. The new plastic connectors are plug-compatible with the respective Han® B metal variants. All contact inserts and modules that can be integrated into the Han B metal housing also fit into the plastic housing. This opens up numerous options for combining new units with existing equipment. Production planners and machine developers have the freedom to choose the material – metal or plastic – for interfaces in line with their needs. The compatibility of the mating faces enables the gradual introduction of the Han-Eco® B in an industrial environment. Existing testing equipment in production can be used for both variants. The advantages of the Han-Eco® are also present in the Han® B size. 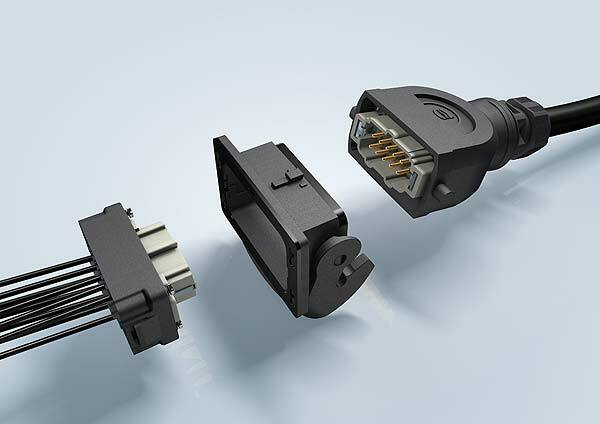 The connectors are not only light and easy to install, but also corrosion-resistant – and offer numerous additional configuration options such as the integration of a PE module. The components are fire-resistant according to UL94 V0 (making them suitable for railway applications) and together weigh significantly less than the corresponding Han® B connectors in the metal housing. The contact inserts and modules that were previously used in the Han® B housings can also be attached to the Han-Eco® B plastic housing via hinged frames. 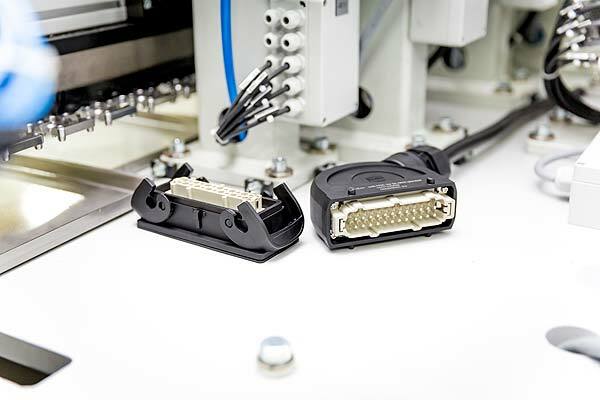 This results in a considerably increased range of possible applications for connectors in plastic housings – driving forward the modernisation of production.